Everyday, motorists around the world are circling crowded parking lots looking for an open spot, wasting valuable time and fuel. FoPark is a next generation parking solution that provides real-time parking availability information to motorists so they can plan their commute ahead of time. Our solution determines occupancy using machine vision and machine learning technologies by parsing live streams of data, from cameras installed on parking lots. This occupancy information is then presented real-time to commuters through a mobile app. Our FoPark data analytics solution provides parking management with precise information on lot usage, peak occupancy times and average occupancy information. It enables parking managers to effectively manage busy lots, manage traffic flow, increase usage to underutilized areas, and increase overall efficiency. 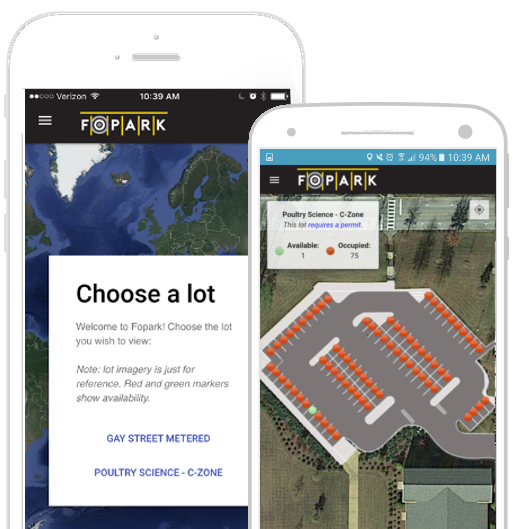 FoPark puts the control back in the hands of the parking lot owner or manager, allowing for improved efficiency and real-time pricing changes based on occupancy, all through a simple mobile app. FoPark's intelligent system records information regarding when the car was parked in a spot, how long was it parked and when it left the spot. This data is presented to the users in the mobile App and the website in an intuitive and easy to use layout. FoPark puts the control back in the hands of the parking manager/owner allowing for effective management and maximum utilization of all parking facilities.oPark puts complete control in the hands of the parking lot owner or manager, allowing for improved efficiency and precision monitoring of how a lot or deck is being utilized. The installation process is similar to mounting security cameras in a parking lot or to a building structure. We will work with your existing infrastructure and minimize the disruption to the usage of the lot, as we wquip you with state-of-the-art technology.